Saama Technologies Inc, a US-headquartered Big Data solutions and services company with an office in Pune, has raised $35 million in Series A round of funding from California-based Carrick Capital Partners, an investment firm focused on technology-enabled service-based businesses. As part of the deal, Marc McMorris, co-founder and MD of Carrick Capital, will join Saama's board of directors. "The critical business problem companies need to solve in deploying analytics is not about technology platforms; it's about designing a complete analytics value chain that can deliver concept-to-action-to-value within an effective performance period. Delivering to this need has powered our growth to date," said Suresh Katta, founder and CEO, Saama. 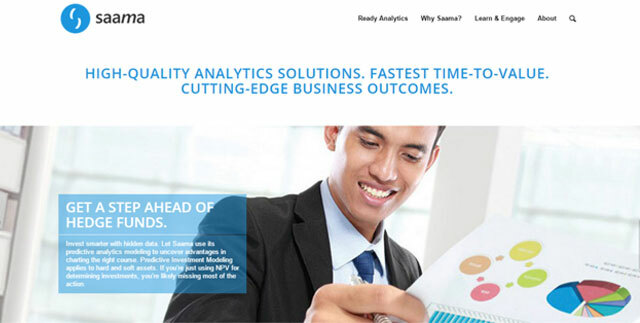 "With this funding and support from Carrick, we will expand our Ready Analytics solutions and increase our Big Data leadership to drive competitive advantage for our customers," Katta added. Founded in 1997 by Katta, Saama is a global solutions and products company that offers solutions in business intelligence, data integration, data quality, emerging technologies, cloud computing and IT business management. Katta, an MS in Computer Engineering from University of Southwest Louisiana, has also co-founded a couple of companies in past, including GVI, a developer of groupware application XTeleScreen, which was later sold to Netscape Communications and Multisoft, which markets graphics products for the Indian market. Saama's clients include Actelion, Brocade, Broadcom, Cisco, CSAA Insurance, Delta Dental, Dignity Health, PayPal, Salesforce.com and Unilever. In 2011, the firm acquired 68.26 per cent stake in US-based InfoSTEP Inc for $3 million from MIC Electronics Ltd, according to VCCEdge, the research platform of VCCircle. "There is not one technology that will guarantee Big Data success. By having a solutions-based approach, Saama is able to create instant value for each customer with a value engineering approach," said Ken Coleman, chairman at Saama's board. Carrick Capital Partners, specialises in investments in technology-enabled services such as BPO, transaction processing and Software-as-a-Service or SaaS. Carrick Capital Partners Saama Technologies Inc.